National mobilization and focus on technology. During the years after 2015, public primary health care services were heavily diminished as a result of the financial crisis and the national budget deficits. This led to the diminishment of the public primary health care services. In the end, the health care system was in such a bad state that senior citizens in need for care did not receive necessary health care services. In 2020, after worrisome media coverage and pressure from all over the country, the Parliament agreed on a political settlement. The care service system had to change – and now, the system is under governmental control. The new services were defined based on two pillars; assistive devices to everyone in need, the so-called “care kits” (security health care kit), and a health care system focused on prevention and healthiness. The purpose of this transformation is to facilitate the senior citizens across the country to live an independent life in their residence – despite impaired state of health and a certain need for treatment. Standardized “care kits” ensure a minimum level of quality and security for senior citizens in need for care, regardless of residence and personal finances. The local municipalities still provide most of the public support services. However, national standards now determine which homecare technologies and services the municipalities must provide. Everyone in need for care is offered a “care kit”. The “care kit” consists of different assistive devices like body sensors, monitoring- and tracking devices that can be worn by the user or be attached to the house (smart house technology). Use of the care kit can enable communication with the family, the health care service, volunteerly organisations or a rescuing service like an ambulance. They can also monitor and act on certain triggers and alarms. This care kit and the corresponding services can be expanded if deemed necessary. The government developed an intensive e-learning aftereducation programme for care-takers that focuses on how to tailor the care-kit to the users needs and how to operate the care kits. All employees in the care sector have to complete this programme. The local municipality is responsible for choosing and installing the care kits in the homes of the users in need. The local municipality is also responsible for monitoring, answering and acting upon triggers and alarms from the care kit. George lives in a municipal-run care home center. Actually, George‘s general health condition is probably still a bit too good for him to be offered a place at such a center. However, he lived in an old, remote and unpractical house. Also, the results from the mandatory Alzheimer screening indicated that he is likely to be in much greater need of daily care in the near future. For these reasons, he accepted the offer of a place at the center. Because of his dementia, George has now got new devices for his “care kit”, among other things, a GPS-responder in his shoe. Now, he has the possibility to take as many walks as he likes, while at the same time allowing the day care workers at all times to be aware of his location. The residents in the care home are well looked after by several monitoring and security technologies. They automatically control the locks on doors and windows as well as the heating and lighting. In addition, the day care home workers log a number of the residents’ activities. Sleep patterns of residents having problems with their sleep can be recorded via bracelets with sleep sensors. Once all this data is automatically compiled and analysed, the caretakers can easily detect health status and anomalous behavour, and early initiate preventive measures. George usually attends the morning gym. The remainder of the day, he keeps to himself except if he prefers to eat in the public dining room. His only contact with the day care workers occurs if something out of the ordinary should happen, which is exceptional. George feels both safe and free to do what he wishes to do. He sometimes finds it a bit unpleasant knowing that at any time he can be watched. However, in his opinion this doesn’t outweigh the comfort of feeling safe in everyday life. Kevin and Laura both need a certain amount of help to get through the day, and their different needs are partially covered by the care kits. Their son and daughter-in-law take care of the rest. For example, Kevin and Laura eat all of their meals with their family. Because of his COPD, Kevin’s physical abilities are regularly tested. He does all his training and measurements at home where he gets instructions on the TV screen in the livingroom. After each workout the data is automatically sent to the hospital. He then talks to a physiotherapist and sometimes to a doctor via the TV screen. Kevin feels that he is starting to get rather well acquainted with the team at the hospital, even if he hasn’t been there himself for 15 months. In order to get all the COPD-equipment costs covered Kevin has to complete a training-program. He hasn’t been particularly positively inclined towards it. However, he was more motivated when he got a new device that measures and aggregates heart rate and lung volume data in an understandable way. He finds it interesting to monitor his performance and watch the progress. Laura monitors her heart, blood pressure and weight daily. However, she hardly notices it and she is only reminded when her doctor calls her when he finds some irregularity in her EKG or blood pressure. This comforts her. However, Laura is a little confused by all the medicine she must take. The dose changes constantly. She is totally dependent on the smart pill dispenser where her doctor can prescribe the right dose and the mobile app that reminds her to take the right pills at the right time. Quite a bit of equipment has gradually been gathered in their home, with the care kits, the COPD medical equipment and the smart pill dispenser. Kevin keeps everything under control, actually much more than strictly required to just use the equipment correctly. Kevin contacts the municipality’s technical support in case of system errors or when he is unable to make sense of software updates. Kevin knows that there are lots of even more advanced measuring devices and sensors that could be useful for him and his wife. Unfortunately they remain far too expensive for them, and he therefore has to stick with the standardized care package. Kevin is a bit frustrated. He thinks that the care package is somewhat outdated, and that it has the potential to be much better adapted to his and his wifes needs and personal life. Laura however is very content with the equipment. She thinks she is lucky that her husband can guide and help her with the equipment. Annabelle has gotten much better after her femoral neck fracture last year. The communal/municipal rehabilitation program that took place at the municipal training-center and at home, was intense and very effective. In her home, fall detectors are installed in every room as part of the care kit. This provides for an increased sense of safety, Annabelle thinks. The municipal health watch have audio- and video access to the rooms when they are alerted by the fall detectors. Then, they can both see her and talk to her, and thereby assess whether their physical presence is needed to help. Annabelle has always been very wary of having cameras installed in her home. But she has realized that this is the best form of security available to her at the time being. She can only trust that the equipment is activated just in cases when she is suspected to have fallen. After her operation, Annabelle needed extra help with practical tasks in her everyday life. She hired a lawyer specialized in laws relating to senior citizens to ensure that she received all the help entitled to her by the municipality. Among other services, the municipality provided for her a domestic helper, who once a week does the housework and helps her with orders from the grocery shop. The domestic helpers note everything they do on their smartphones, including the shopping list for the grocery. The report is sent back to the municipal care service and the grocery order is sent directly to the store. That way the domestic helper reports and logs everything at the same time, which is “done” for each patient during the home visits. While the domestic helper were/are logging and reporting, Annabelle would serve coffee. She almost misses it, now that she is nearly completely recovered and no longer needs the domestic helper service. 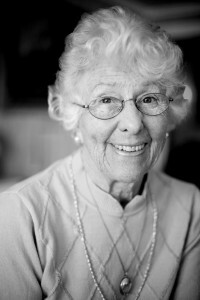 Annabelle keeps in touch with her children and grandchildren through e-mail and chatting. But she doesn’t enjoy sitting in front of a computer for too long. Annabelle is happy only so far. Her recovery was quick and successful. However, she still isn’t used to the technology of the care kit. She’s still very unsettled by the thought of people peeking into her privacy without her being aware of it. Additionally, she often feels lonely and has had a few “accidents” in order to call the health personel, even though it wasn’t quite that serious. Should there be taken national measures to significally increase the use of technology in the health care sector? How should the government play its role? What are the opportunities and challenges for the senior citizens in the situation described in the “one size fits all scenario”? Are the [local municipalities] prepared to carry out and operate new technology according to new, national standards? What are the major challenges for the local municipalites in the situation described (competenences, costs, attitudes, other)? How can these challenges be overcome? During the years after 2015, a new political climate emerged. Public services had nearly collapsed because of limited economic resources and weak local governance in many municipalities. Now, alternative ways of organizing the healthcare service / social care / welfare system influenced public debate. In 2020, the municipal care sector was liberalized all over the country. Simultaneously, the Parliament established a system where incentives for care recipients go directly to the care recipients. Everyone in need for care is entitled to incentives based on their health condition. Each and every one can use these financial aids – likely combined with personal finances – to be spent on the particular services they want and need. The municipality’s responsibility is now to ensure the existence of an adequate supply (national standards or higher) of care services for those living and residing there. At several places, the local care services are shut down, while some municipalities still provide care services in competition with private operators. The municipalities who manage to create an excellent professional and working environment are most successful. That makes them competitive as both employer and service provider. Because of his dementia, George cannot purchase health services by himself. The municipality has therefore taken the responsibility over his govermental financial aids, and they’ve made sure he has health ensurance. At first, the municipality transfered him to a large apartment-complex that was run by an international company. The company was highly competitive on price, and could offer a simple and heavily surveilled apartment. Alerts were transferred to a care-central in the top floor when something was wrong. But the low prices reflected low standards. There were constantly recurring technical problems, the complex was understaffed and offered few possibilities for social activities and informal gatherings. George felt isolated and became less and less active, and his physical and mental health deteriorated. This center was closed when the company withdrew from the country market, and all the residents were forced to move. As George didn’t have anyone to support him, he was prioritized in the queue to one of the municipal dementia centers. There, the sanitary conditions are excellent. The public areas as well as the private rooms and bathrooms are automatically sanitized daily. In the apartment, a speech based day planner reminds George when meals are served, when the group activities are organized, when he should go to sleep etc. George doesn’t have much contact with the personnel. Thanks to these reminders, he manages mostly by himself. As of lately, George has been struggling. Because of his dementia he is not capable of navigating through the many options available for him. He also had to move, and this has burdened him significantly. Fortunately the municipality has made sure that he now is in a good place. One can only hope that the center is well managed, so he doesn’t have to move again. A few years ago, Kevin and his wife decided to buy a larger house together with two other couples. The reason was that their son and his family moved to another part of the country. Together they subscribe to a nursing- and care service. Kevin and Laura can call nurse Anne whenever they need her. She is very knowledgeable and has continuous contact with the most modern private hospitals around. When Kevin needs help from a doctor, he first consults his general practitioner (GP) via email. The doctor is very familiar with Kevin’s COPD symptoms, and knows how to give him good advice. If necessary, the doctor requests the private hospital in the area to take action, either in Kevin’s home or at the hospital premises. The internet-connection is the most important piece of technology Kevin, Laura and their co-residents have. They make frequent use of the television screen to communicate with their friends and families who live all over the country. Kevin and Laura are also very active on social media, keeping in touch with other COPD- and cardiac disease patients, the web-church, as well as their son and grandchildren. They also use the screen to consume lots of rented movie classics. Kevin is sometimes annoyed by many of his old friends and collegues, who use the Internet for little else than writing e-mails and surfing. He’s hoping that they will soon realize that there are many other and better possibilities that Internet has to offer. Kevin is a keen user of his smartphone. He is always updated on new mobile apps and –sensors. When he is reading about a sensor or an app he believes can help him to better cope with this COPD, he is advising his doctor to let him try the equipment. He has found and tested several devices that are so good that his doctor and his patients now use them on a regular basis. Laura goes for a walk in fresh air daily and is content as long as she feels safe doing this. Her husband only occasionally keeps her company. He is in a far worse condition than she is. Kevin recently purchased a clock for her that can track her steps and alert him if Laura would fall. Kevin and Laura are happy with their social life and have good care around them. Through the remote medical treatment program, Kevin’s COPD is closely monitored. However, Kevin and Laura miss their son and grandchildren. They recognize the shortcomings of keeping in touch only through the Internet, although it is very useful. Annabelle lives by herself and has been feeling anxious and lonely. A couple of years ago, she started using some of her savings on a more social life. She now allows herself to pay for a “personal assistant” twice a week. Her current assistant is from Estonia and is called Jelena. Annabelle got to know her last year. She had just switched agency, as the former was both expensive and unreliable regarding appointments and invoices. Jelena, on the other hand, is reliable, helpful, speaks well English and Annabelle thinks they go well together. Jelena helps with practical tasks, but usually she joins along for walks, cafés, exhibitions or other similar activities. If there is anything, which could be useful for Annabelle, such as the fall detector or the electronic doormat, Jelena will present them to her. But some of Jelena’s suggestions haven’t been very useful to Annabelle, for example the heart rate band-aid or the fully automated body washing machine… Annabelle’s daughter has warned her that she shouldn’t buy all of Jelena’s new offers. She thinks that Jelena probably gets a commission for each sale, and that her mother’s best interest is not always Jelenas primary concern. After she fell last year, Annabelle found a rehabilitation service that had received high ratings from previous customers and commentators online. Shortly after she had signed a contract with them, they sent her an exercise machine, which registered all her exercise. A screen showed her what to do and how well she was performing as well as compiled a “final report” on the day’s work. This service also gave her the possibility to participate in online exercise classes with other customers, several times a week. Lately, Annabelle has started online-dating. It was Jelena who first mentioned to her that a meeting place for senior citizens exists online, and it could actually be a lot of fun, if she is aware of some rules in the communication. In fact, she is chatting with one “suitor” already! But sometimes she is not sure about the meaning of short messages and she doesn’t want to meet him in real life yet, and she still hasn’t told her daughter about it. Annabelle has done fine. She has a solid personal economy, she is capable of choosing between the different services on the market, and also has a daughter that can help her. But it is somewhat of a hassle to constantly be on the lookout for new services, switching between them and making sure she isn’t tricked into buying products she doesn’t need. How can the municipality be an attractive player in the competitive environment? How can an open market influence the use of technology by the players in the care sector? How about the use of technology by the mulicipality? Will a market for elderly care drive forward useful and useable technology for most people? In which areas? For whom? Who will have the benefit? Are there any challenges or ethical dilemmas with a growing consumer technology market for senior citizens? How can these challenges be overcome? Mobilizing the senior citizens, their family and the community. After several years of overloading the public care services, the government established the Community for the senior citizens program in 2020, which called for a mobilization of senior citizens and volunteers in all municipalities. The idea was to invite healthy senior citizens, their relatives, neighbours, charity organisations and other volunteers to a national boost, to relieve the workload of the care services. The program introduced new types of financial subsidies, like funding of voluntary projects within the municipalities. The initiative also spured many bottom-up initiatives by the local community, schools, volunteering organisations etc. Simultaneously, an increasing number of municipalities decided to open up for an open market of new care service operators. All these new companies have to satisfy high national standards for quality and dignity. Foreign businesses may now be authorized as care service provider for Irish municipalities. There are also some new trends. Senior citizens, more often than earlier, share resources as well as expences for housing, healthcare and help for everyday tasks. Information technology is used to coordinate the supply and demand for volunteering resources like IT-competence, gardening help or chauffeur assistance. The local municipalities are responsible for ensuring that there is a proper healthcare for its inhabitants, including monitoring the quality of care provided. The local municipalities are required to deliver some health services, to manage licenses for private operators and to mobilize coordination of the volunteering organisations. His local municipality helped George with a place in a private care centre for dementia patients. George has his own room with a bathroom, and enjoys common facilities for social activities, such as a canteen and a nice garden outside. As George loves the garden, his need for long walks has decreased. George wears a watch with a tracking sensor. When he moves more than 500 meters away from the housing complex an alert is sent. The alert is first directed to a network of volunteer search party, next to care personnel. The closest available person on duty gets the alarm and will immediatedly take action. Last time Georgewent for a longer walk, a person in the search party was able to call George and guide him back home while talking to him over the phone in the watch, even if George was a bit confused and did not understand where the voice came from. Luckily, they did not have to start a search party this time. The whole centre has smart house technology installed that makes sure the residents are safe. As the centre is rather short-staffed, they can only manage the heaviest and most important tasks. Thus, relatives play a key role in executing care services, and they meet regularly in the support group at the centre. As the common rooms and canteen is open for everyone, it has become the place to meet for retirees nearby. There are a lot of activities going on. In exchange for very cheap meals, the volunteering senior citizens helps out with cooking, serving, cleaning, organizing cultural events or trips, provide courses etc. In that sense, the centre is very much influenced by the active senior citizens, more than by the dementia patients living there. Even though George meets people every day during common meals, he keeps to himself. He joins very few of the organized actitivites. Thus, he very much enjoys when the school children from the neigbourhood visit daily the residency together with a trainer after school to write their homeworks. They often also have a chat over a cup of cocoa. George is safe, but lonely. The local municipality found a safe place for him, with a lot of freedom to do whatever he wants. His dementia, however, limits both the pleasure of socializing and George’s own initiative for joining the activities. George keeps to himself most of the time, as he has no close relatives to help him. Kevin and Laura live with their son and his family. They help them with their everyday tasks, for which they receive care benefits from the local municipality. As his son and daughter-in-law work daytime, they help the couple in the morning and at night. They are however feeling a bit tired, both having a full-time job and caring and cooking for both their children and parents (in-law). Having poor health Kevin does not go out very much to meet other people. Laura is still in relatively good shape and goes to the grocery shop daily, to get her exercise and to meet her neighbours. Kevin uses social media actively. Amongst other networks, he is part of the municipal online community for senior citizens, where he helps others with choosing and using new technology. As Kevin’s responses are appreciated, other senior citizens recommend his help to others. He is always busy. The hours spent helping others, are exchangeable and may provide Kevin other kinds of help, like gardening or giving him and Laura a ride to the senior citizens centre once a week. When Laura goes to the grocery shop she also checks in on three of her neighbours on her way. She ticks “ok” on a smartphone app if she sees that they are ok, as they often are. She was a bit confused what to do the other day when she found her next-door neighbour on the floor with a broken hip. But after clicking the “alarm” button on her smart-phone app she soon got to talk to someone who calmed her down and instructed her what to do. Within 5 minutes an ambulance was in place. She is happy she can help her neighbours but she also appreciates that she gets an hour free cleaning of the house for providing this service. Kevin has a workout schedule in order to cope with his COPD. He is able to watch his progression via a smartphone connected to body sensors monitoring his sessions and pulse. Kevin shares the results with his physiotherapist, who enhances the schedule continuously. Kevin’s son also gets access to these results, and encourages his progress. Even though Kevin is not completely comfortable with his son’s monitoring, he appreciates the support. Kevin feels fitter and is able to cope with his COPD better than before. Kevin is in the network that is keeping him active. Despite poor physical health, Kevin shares his technological expertise. He has a key role in the community. Kevin has neither the time nor energy for socializing more than he already does. Laura meets her neighbours daily at the shop. She helps out by passing by her not-so-fit neighbours. Maybe one day, she will be in the same situation as them herself. Annabelle moved to an apartment block for senior citizens in the town centre. Annabelle socializes daily with neighbours and other retirees nearby. They organize various social activities, outings etc. The neighbours have cooperated in installing smart devices and monitors for the whole apartment building. They also subscribe to services for housekeeping, care taking, physiotherapy and technology support. Annabelle uses her TV and communicates via video and voice chat to keep in touch with her family. She is an active user of social media to keep updated on friends, news and communities she has joined. For several years, Annabelle has been using fall detectors and body sensors that are integrated into her clothing. In case of a fall, unusual behavior or abnormal body measurements an alert is generated. The alert is automatically sent to the closest person on hold that is most suited to the incident. Her neighbours have established a duty scheme that can deal with lighter incidents. They are often closest and can alert an ambulance or care providers if needed. Severe health measurements are sent directly to the care provider. When Annabelle slipped in the bathroom last year, she experienced that help arrived quickly. It was admittedly a bit embarrassing that it was Sean, who lives across her, who would find her in such a situation. After her femoral neck fracture, her rehabilitation was taken care of by the physiotherapy service she and her co-locators subscribe to. This service consists of volunteering students who are testing out new training programs on them. The ability to measure the effect of the training programs gives the students feedback to improve and tailor the programs. Annabelle finds the variations refreshing, even though she does not meet the physiotherapists in real life very often. Annabelle is very happy. She has been fortunate enough to be part of a well-functioning social network. Her rehabilitation is working well. Her current ambition is to be able to walk all the stairs to her apartment. The only thing disturbing her is how and where her body measurements are used. Can new technology enable good communities? How and for whom? Can new communities, together with new technologies improve senior citizens’ lives? Can it relieve the public care system? How or why not? How can one succeed with mobilizing the senior citizens and and other groups in the society – meeting the senior citizens’ needs? Is there a need for technology to play a role to achieve this? If so, how? Are there any challenges or ethical dilemmas due to the mobilization of volunteers in the “volunteering community”? How can these challenges be overcome? In each one of the scenarios, we meet four senior citizens with different needs and desires in order to live an independent life. The four persons are introduced to show that different people face different challenges and opportunities. Those will differ throughout the scenarios. George suffers from dementia. Being single, he depends on professional help and support in order to live on his own. As George and his wife were divorced 40 years ago and they had no children, George has no close relatives. George lives alone in his own house in a small town. George had many different jobs over the years. During the last years of his working life, he was a long-distance bus driver. His retirement pension is relatively modest. George is in good physical condition and enjoys moving around indoors and outdoors. As dementia causes disorientation, George needs help finding the way. His occasional amnesia makes him dependent on help remembering and to control his personal economy in order to be able to live by himself. George enjoys different social activities – but he does not always remember to take the initiative. Kevin is a retired engineer. He lives with his wife Laura who used to work as a teacher. They live on the countryside with their son, where they share a house built for two generations. They have a smaller, personal apartment and they share the living room with their son and his family. Their family ties are strong, and they have daily contact with siblings, their son and their grandchildren. Kevin has never been good at exercising nor had a healthy diet. Being a heavy smoker Kevin is severely affected by COPD and has trouble moving outside the house. Laura has a cardiac disease. She has to monitor her heart condition regularly and adjust her medications carefully. She is dependant on daily exercises. Kevin has always been the “tech freak” of his family. He loves new technology and still eagers to test new products – trying everything he manages to get hold of, from new mobile apps to assistive devices and medical equipment. Annabelle is a retired lawyer, has a strong economy and lives in a large city. She has been exceptionally healthy almost all of her life, and has always cared for her own health. The last year, however, Annabelle has gone through intensive rehabilitation after a femoral neck fracture. She is still – to a certain degree – physically impaired and has become more anxious after the incident. Annabelle enjoys the company of others. As her two children live elsewhere with their own families, and Annabelle was widowed many years ago, she wants to meet new people and establish a new network of likeminded. Even though Annabelle used a pc for many years of her working life, she is not interested in computers or other digital tools. Annabelle finds new software or “gadgets” demanding. She is also sceptical to how safely the different systems process her personal information. How can the elderly care be better in these scenarios? How can technology help people to improve their living condition at home or in other residencies? How can technology help us improving elderly care (competences, skills etc)? Are there needs for diversification, i.e. special or personal needs when suffering from dementia? Is there a need for additional training of nurses and other health care personnel on the use of technology in the elderly care? What can be the major pitfalls of using various care technologies? How can care technologies be experienced as intrusive or unpleasant surveillance? How is privacy balanced with feeling secure in the care services? How far are we willing to use technology if it will deprive the autonomy of the senior citizens? How can the use of technologies result in the senior citizens being less or more isolated from their communities? Some of these concerns are reflected in the scenarios. They are of course not an exhaustive list of concerns. The aim of the stakeholder workshop is to identify and specify these concerns/dilemmas and to use them as a starting point for the creation of the visions and policy recommendations. In this project we will use 3 scenarios as a tool to stimulate debate about the future of elderly care. Scenario analysis is a process of analyzing possible future events by considering alternative possible outcomes. The scenario analysis does not try to predict the future, neither is it a coherent analysis of all aspects of a possible future. Instead, it presents consciously several alternative future developments. 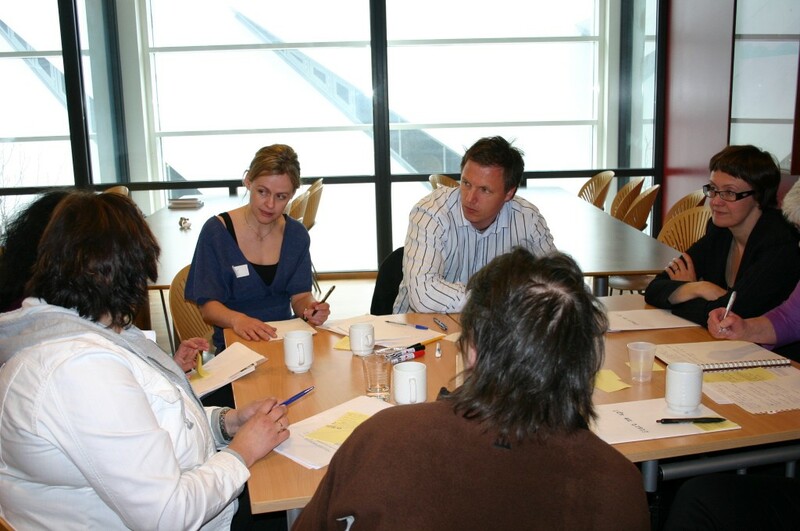 Participants in scenario workshops are typically people who have a stake in the future of elderly care. In the present case this can be representatives for the senior citizens themselves and their relatives, people working in the health care sector, local politicians, people from industry, research and development and volunteering organisations. Stakeholder involvement is a way to make the decisions more robust and socially acceptable. Involving relevant stakeholders in the process can give them ownership to the process. This in turn can make implementation in society easier. The scenario workshops in the PACITA project will produce visions for what kind of elderly care services the Europeans (through the expressed and confronted views of a divers range of stakeholders) want and policies needed to achieve these visions. A vision in the context of the PACITA scenario workshop is a picture of a desirable future in the elderly care. It can reflect ethical, social and/or legal challenges, which were identified during the workshop procedure. The quality of life of a senior citizen in the future will be influenced by a number of factors, like their family situation, whether they live in an urban or rural area, their religion, their ability to participate in social life etc. This project is concerned with choices that the politicians can take for improving the future care services for the senior citizens – and the dilemmas they are faced with. Is it the public or private health care providers who are providing future elderly care? How do the senior citizens and other groups in the society organise themselves in order to meet the needs for care? In the PACITA project, we have chosen to look at these two main concerns as two axes. On the horizontal axis the one extreme is that the government decides which technologies everybody will be entitled to, and the other extreme is that people can choose freely themselves from an open marked. On the vertical axis, the one extreme is that the senior citizens themselves, their relatives and the community cooperate and help out, and constitutes the major resource in the elderly care. The other extreme is that each senior citizen has to find and choose his or her own care services. The three scenarios illustrate different ways the community can develop. They show in particular how the health care services may develop, how the municipalities may be affected by increased government control, a stronger private sector or a better organised voluntary community. The scenarios also illustrate what municipalities can do to tackle the different reality models. Scenario 1: One size fits all is based on the assumption of lack of labour in the future, and it describes a large-scale governmental initiative using technologies to make people more self-reliant. 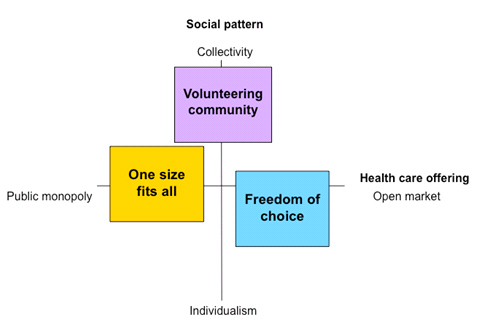 Scenario 2: Freedom of choice is based on a new political system where [incentives for care recipients] go directly to the user, and this scenario furthermore describes a society where you can buy a great variety of care services from the open market. Everyone in need for care is entitled to [incentives and financial support] depending on his or her health condition. Scenario 3: Volunteering community is based on volunteering people as the key resource for the community and for each other. This could include the senior citizens themselves, their relatives, charities, neighbours, school children etc. The [council/municipality’s] main role is to mobilize coordination of the volunteering organisations. To create awareness of the choices we make today and make them more tangible, we develop user stories. These are three stories about four individuals how they live their lives in 2025 in the given scenarios. You will meet George, Annabelle and the couple Laura and Kevin on page 3 Personnas. The year 2025 is chosen because the population projections show a clear increase in the ageing population. 2025 also makes room for several years of technology development.